The Golden Gate Bridge and Highway District once charged tolls on a per-passenger basis, and it cost a nickel extra for every person in a car in excess of the driver and four riders. The district also charged a nickel for pedestrians with bicycles. As late as 1991 the district charged fire engines toll, as it did when Marin County apparatus crossed the bridge while responding to the Oakland firestorm. 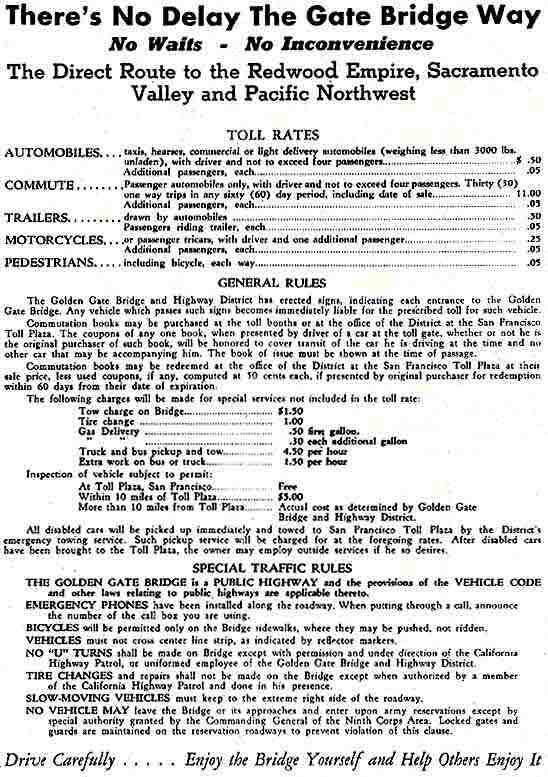 Here are the original toll rates, and general rules of the bridge, as published in the Official Program, Golden Gate Bridge Fiesta.